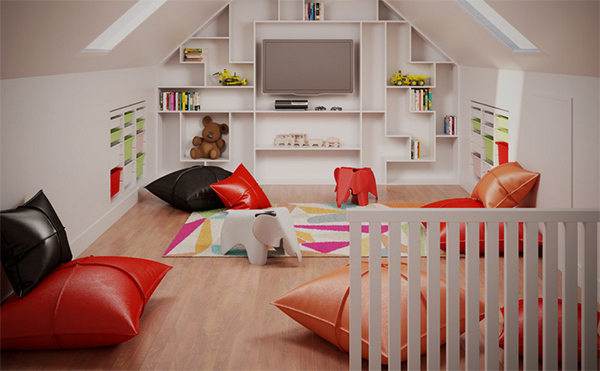 Playrooms are a great place for kids to get creative within a safe environment. Most children love having a special place all to themselves, other than their rooms. If you house permits it, playrooms are great for keeping toys neat and contained. They are also a way to let your kids express themselves well into their teens. There are so many different ways to furnish and decorate their personal space. A great way to ensure they will love it is to get their input. While they are fun to decorate, playrooms shouldn’t break your budget. They don’t have to be overly fancy; they just have to be fun. 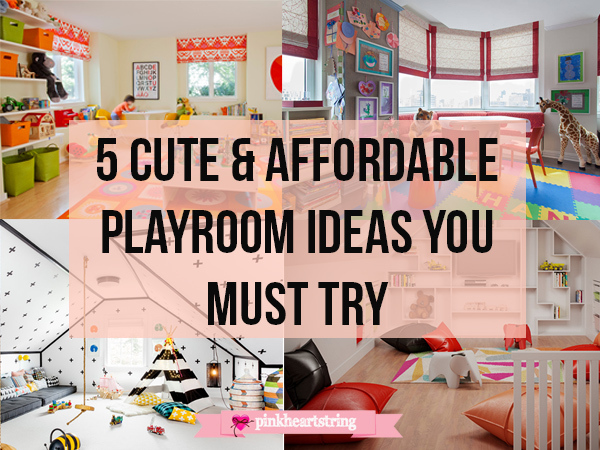 I’ve gathered together my favorite playroom ideas that you simply have to try! First things first! Safety is so important when creating a playroom for your children. You want to be able to leave your kids in the playroom, knowing they are safe. When decorating a playroom there are a number of things to consider, no matter what age your child is. Safety comes first and even teens need a safe environment to work and play in. ● Do your research on things such as corded blinds, outlets, cabinet doors and certain paints. Consider these things in your initial design. ● Consider using soft storage containers, over heavy buckets that can be pulled over and cause serious injury. ● All furniture over knee height should be secured to the wall, even in teen rooms. If they climb up onto the furniture it can easily tip and injure all ages. ● If you’re remodeling consider the paints and other materials you use. It’s important to have a vision of how you want the room to look and how to incorporate it. 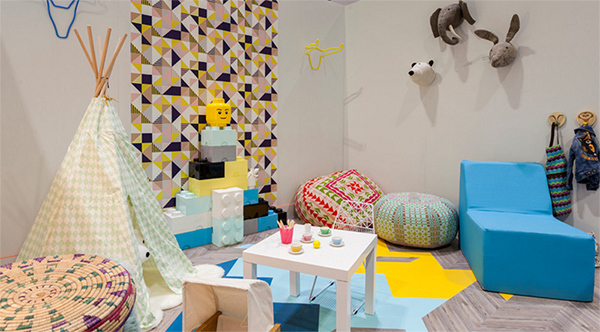 Having a colour palette or theme can make the playroom a lot of fun. 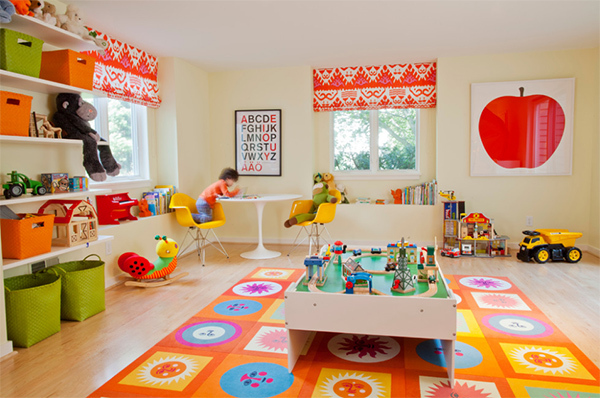 Playrooms are a great place to go bold! Children respond well to bright colours and patterns and this is the perfect place to go crazy. The furniture you choose for your playroom should have a purpose; ensure you start with the basics. Every playroom needs plenty of storage and a table and chairs. Most children love to colour, write and play with Play-Doh amongst other activities. That’s why it’s important for them to have an ergonomic place to sit and create works of art! Bring the outdoors indoors with artificial synthetic grass rugs! While it’s great for the kids to play outdoors in the fresh air, the weather doesn’t always allow it. They will feel as though they are outdoors while being safely inside, where you know they are safe. This is also a great idea for playroom flooring because it is easy to wipe and vacuum. It is hard-wearing and doesn't show stains or marks. Simply staple gun to the floor and away you go. Play rooms are often transformed into a rumpus room for the whole family. This can make the kids feel like their space is no longer their own. To resolve this, create a space for them to be alone and have some downtime. A little couch, tent or a cosy corner with pillows and blankets can provide the perfect place for them to unwind and get comfortable. It is important to remember to create a playroom that caters to your child in particular. Remember to involve your children in the process to ensure they feel comfortable and will love spending time there.